This Coconut Shrimp is the perfect amount of sweet when you balance it with the tangy raspberry sauce. This sauce is great with other seafood too! In a bowl, mix the unsweetened coconut, panko and flour. In another bowl, whisk together the 2 egg whites. Dip the shrimp into the egg whites, then press into the coconut mixture. 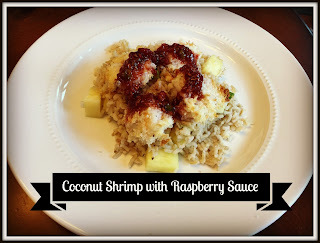 Lay on a baking sheet and bake at 425 for 10 minutes, until the shrimp is cooked through and coconut is starting to turn golden. While the shrimp is cooking, place the raspberries in a small pan and mash. Place over medium heat and cook for one minute. Add the brown sugar and vinegar and cook for 3-5 minutes, stirring often. Add the scallions and season with salt & pepper.